Oooh, gotta love that alliteration, in both languages! We used to have a malunggay tree (moringa tree) in the backyard of the second-ever house we lived in, and yet, malunggay was never a staple vegetable on our table. If memory serves me right, I was only introduced to this dish when I asked our Yaya what she was eating one day and she let me try it. 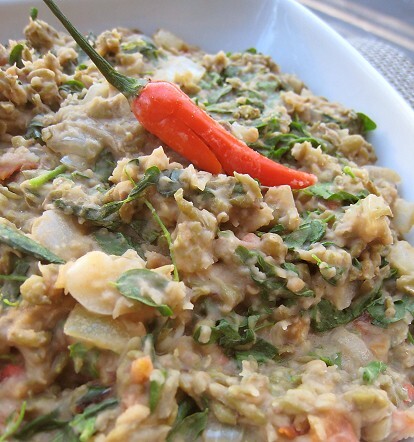 I loved munggo't malunggay and I would often request it of her on occasion. Wikipedia's entry on malunggay (moringa) is very informative. 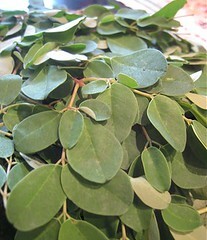 Moringa is an "exceptionally nutritious vegetable tree", with almost every part able to be used for food. It's even used as a "micronutrient powder" to treat diseases! I have only seen malunggay as leaves or greens, but apparently, its pods are also commonly eaten (both immature and mature pods), as well as its flowers. So there it is, malunggay. See the branch structure? I had to pick all the leaves off of the stems and I must say, I have realized that picking leaves off stems is a kitchen task that I completely dislike. These were even tougher to pick off than other leaves. I was almost ready to give up and I was truly tempted to chuck in the stems as well! 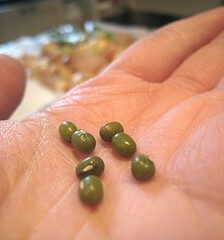 Mung beans are, of course, where "bean sprouts" come from. 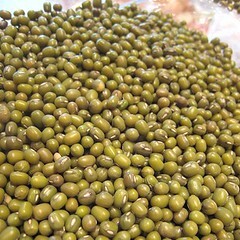 I believe mung beans are pretty widely used, so, if you wish for more information, hop over to Wikipedia. I must admit, I don't really have any memory of munggo't malunggay, so I didn't know what JS was talking about. One day, she just handed me a printout of a recipe for Munggo Guisado ("Sautéed Mung Beans") from 80 Breakfasts and told me to make it. Since the printout had no pictures, I was left to imagine how this dish was supposed to turn out. Since it was a "guisado", I assumed that this was a sautéed mung bean dish! But, apparently, I was wrong. 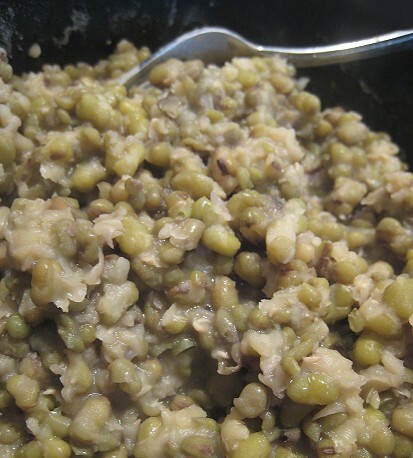 I started by boiling the mung beans in water. I checked them after a bit and they were still too firm. However, after a mere 5 minutes, I checked them again and they were too soft! Or so I thought, thinking this dish was a sauté dish. I proceeded. A Philippine "guisado" dish usually has the following ingredients, if I'm not mistaken: garlic, onion, tomato and fish sauce. 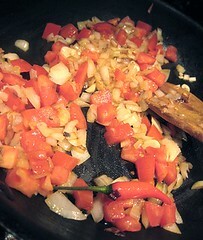 So, I heated some oil then added my garlic, chopped onions and tomatoes. I also added a chile pepper for some subtle warmth. The boiled mung beans went in next. The recipe actually also called for tinapa (smoked fish), but we didn't have any. So, I relied on the fish sauce to give that fishy, umami flavor. At the final moment, the malunggay leaves went in. We ate this dish with rice (of course). 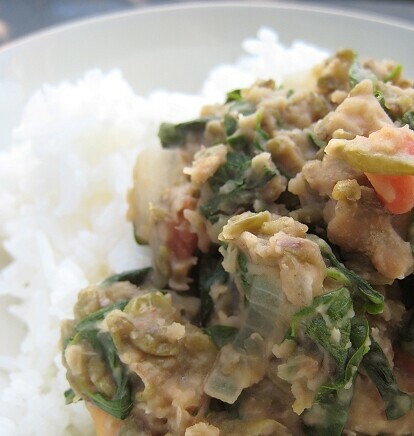 This "munggo guisado" wasn't as soupy as I remembered our Yaya used to make (I would make it soupier next time) but the sweet, hearty earthiness of the mung beans was as delicious as I remember it. If only the malunggay weren't so hard to pick! Our version had some stems and I don't recall Yaya's version ever having little stems. I guess Yaya actually took the time to pick out all the little leaves individually! Malunggay is not so easily available, so I think I'll substitute another vegetable with a deep, green, leafy flavour. Kale comes to mind. I have since learned -- looking at 80 Breakfasts' post with pictures, and from JS -- that "munggo guisado" is actually supposed to be more like a stew than a sauté dish. The name of the dish is deceptive! So I guess my mushy mung beans were all right, and I could've just added more water. Since mine has a different consistency, I'm christening this dish a "mush". Yes, I'm making up this genre of food. Munggo Malunggay Mush. 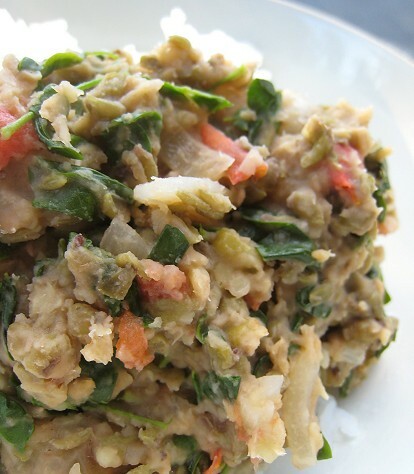 Mung Bean & Moringa Mush. It's just too fun to say. If you'd like to participate, see who's hosting next week. WHB is hosted this week by Graziana of Erbe in Cucina (Cooking with Herbs). I'm envisioning all those flavors mashed together -- and it's just lovely. So, where did you get the Malunggay? 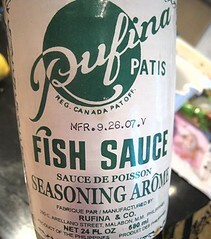 We bought ours from our usual Chinese/Asian Supermarket (T&T). Sometimes they have it, sometimes they don't. I guess the demand is not that high, because when they do have it, the malunggay are already packaged and each package only has a small amount. 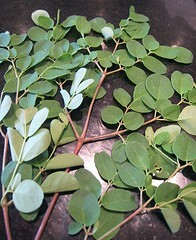 Moringa tree looks really interesting, I haven't heard about it before. Thank you for the informations and for sharing this with WHB! It just that each individual leave has a tiny-tiny stem that's connected to the larger stem. TINY, TINY stem!!! Oh, ginger! When you say pork & shrimp in it, it makes it very "Chinese" for me. =) And hey, CORN you say! But I wonder if there are sticky ones here. Oh, that's a good tip... we should scour the Indian grocery stores! 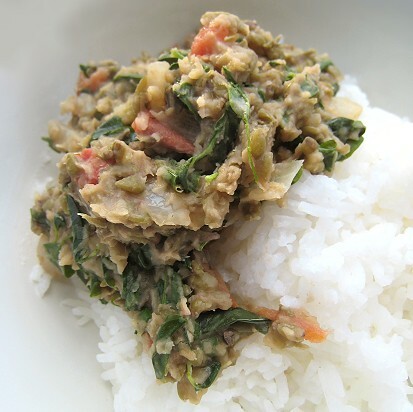 I guess the moringa leaves in dahl is like this dish! Especially when you take into account that this dish is actually supposed to be "soupy". I don't think we've had the leaves in eggs before, but that's a great idea. It looks like I'm finding this post a couple of years late, lol. I was wondering if you had found any seed sources in Vancouver so we could grow our own. If not, any suggestions I might try? Cheers!! Thanks for all the info... it sounds delic! Anon: I'm not sure if the mung beans made for consumption will sprout. one could certainly try! Otherwise, perhaps some gardening stores will have them, or perhaps some health food stores. Good luck! Love it! I'm going to try it this week-end! thanks for sharing! We see them sometimes at T&T. You can also try other Asian/Filipino markets.